Chicken Parmesan with a twist! 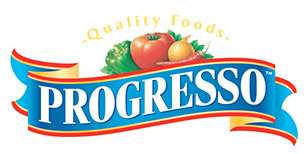 Create a deliciously easy weeknight supper with our Progresso® High Fiber chicken Tuscany soup. 1. Place Bisquick in large resealable food-storage plastic bag. Shake each chicken breast in Bisquick; set aside. 2. Heat oil 12-inch skillet over medium heat. Stir in garlic; cook until garlic starts to lightly brown. Add chicken breasts; cook 6 to 10 minutes, turning once, until browned. 3. Pour cooking sauce around chicken. Heat to boiling. Reduce heat to medium, cook 5 to 8 minutes or until juice of chicken is clear when center of thickest part is cut (at least 165°F). 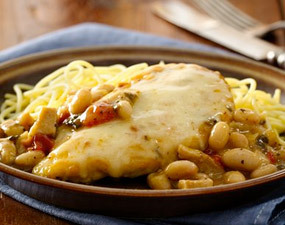 Sprinkle each chicken breast with 2 tablespoons cheese. Remove from heat; cover and let stand 5 minutes or until cheese is melted. Serve with gluten-free spaghetti.